You don’t need to rely on commercial pie crusts this season. 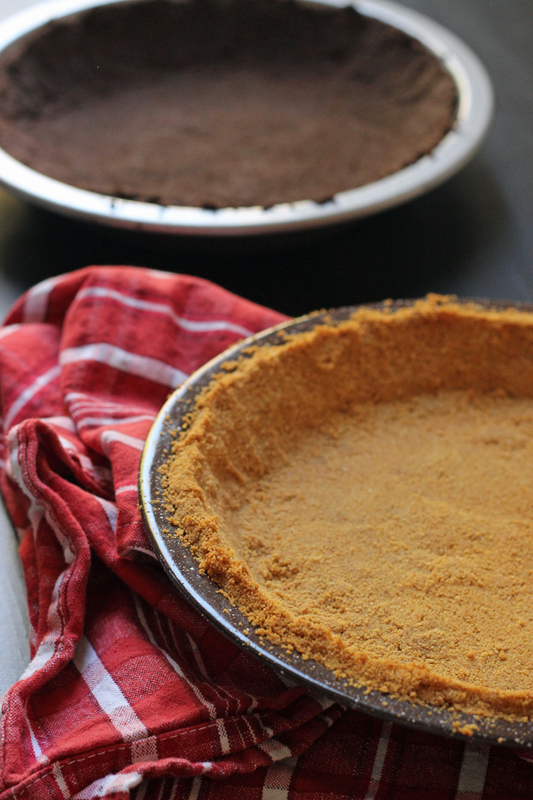 You can make your own Homemade Graham Cracker Crust as easy as pie. Pie is probably my very favorite baked good. Cheesecake is a close second, but when I think of comforting desserts or a sweet treat that I want to bring to a party, pie is the winner. It may be from growing up near a Marie Callendars where pie was a big deal or maybe the fact that one of my first and best memories with Gramma John was making a pie with her. Doesn’t matter, pie is the winner, in my book. One thing that can make or break a good pie, however, is the crust. Last year I shared with you how to make homemade pie crust without freaking out. This year I thought we’d chat about graham cracker crusts. 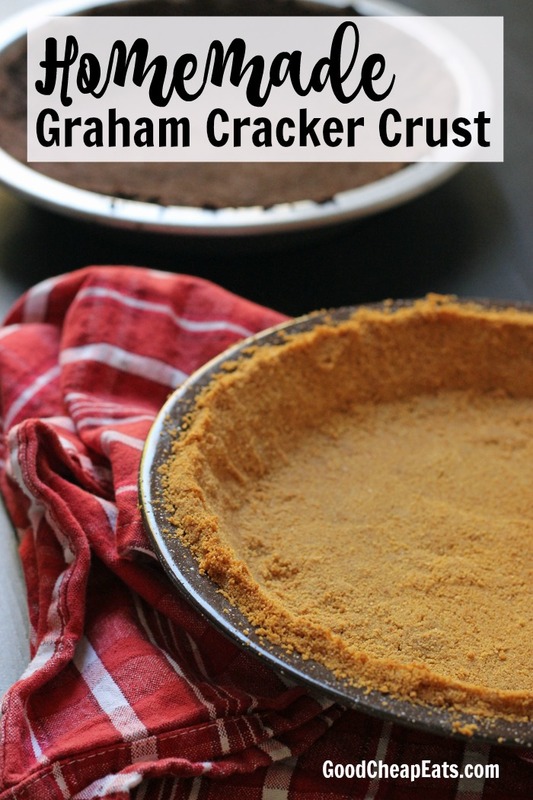 Make your own homemade graham cracker crust. 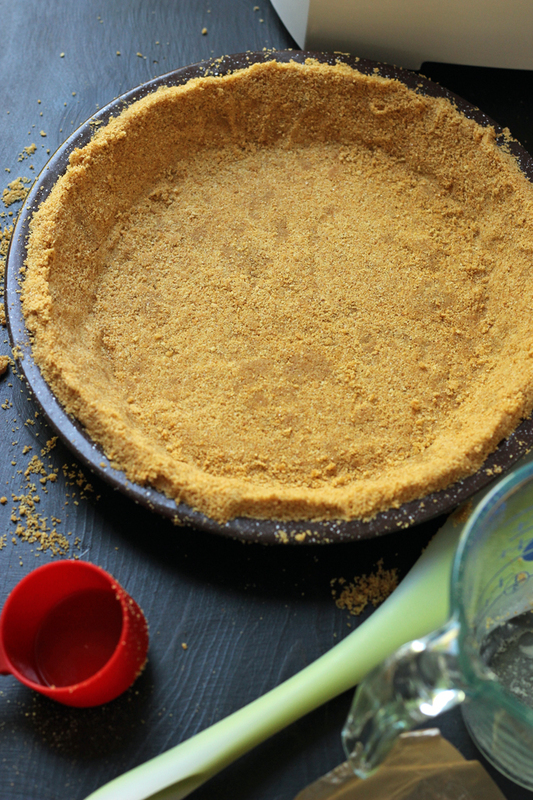 Believe it or not, you don’t have to buy a commercially-made graham cracker crust. You can make your own in just a matter of minutes. It’s super easy and the same method can be applied to any crumb crust, whether you’re using crackers, cookies, or even pretzels to build the crust. This crust takes the Best Pumpkin Pie in the World to new levels. Trust me. While a commercial crust can be super convenient, there’s something a little more special about preparing a pie in your own pie dish — much prettier than those foil thingummies — and the flavor and texture of homemade is better, particularly with butter. Yum! Stock up on ingredients when they are on sale. There are only three ingredients in this recipe: crackers, sugar, and butter. To economize, buy these items when they are on sale and buy as much as your budget and storage space will allow in order to stock up until the next sale. You’ll find that the winter holidays and Easter tend to garner great sales on these items. You can freeze the butter until you’re ready to use it, so don’t hesitate to stock up. Watch for items on clearance. Often times I’ll find these same items on clearance after the holidays, but also year-round. Clearance groceries are safe! Often times the packaging is changing or the store is discontinuing the item, so they want to unload it fast. Just check the expiration dates so that you have enough time to use it up. food processor – I have had a food processor for 23 years and use it several times a week. I preferred this model, using it long after I bought the upscaled version in 2011, but the motor finally died on the older machine after 14 years of service, so I’m getting used to the fancy pants machine. pie plates – I have several different kinds. Pictured are this one and this one. Pyrex 2-cup measure – I have several of these; they work great for measuring larger quantities and melting butter. silicone spatula – I love this two-sided spatula/spoon. It’s great for stirring and scraping. I bought it originally to flip crepes, but I’ve since bought more since it’s so handy! 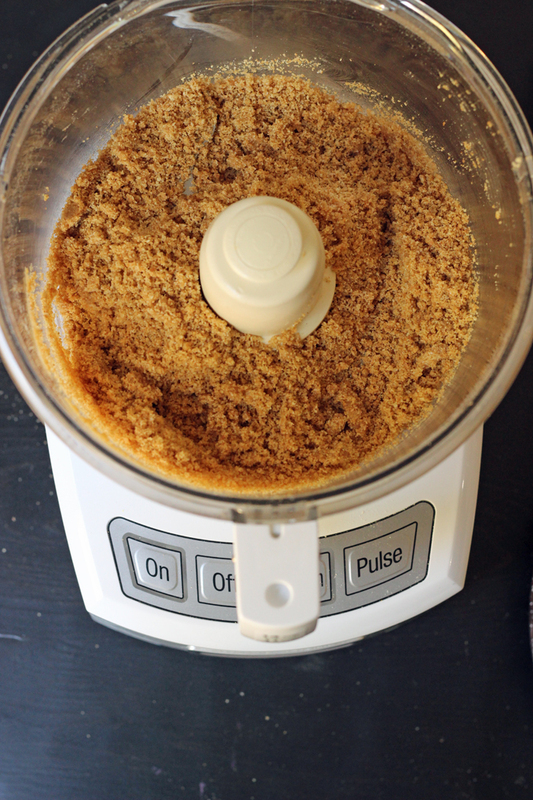 Process the graham crackers in the bowl of a food processor fitted with a metal blade. You want very fine crumbs with no lumps. Add the butter and sugar. Press the crumbs very firmly into a pie plate and up the sides. Using the bottom of a measuring cup can help to press firm. Bake the crust for 10 minutes. Cool completely on a rack before continuing with your pie recipe. If the pie recipe calls for an unbaked crust, chill it in the freezer instead of baking it.